Me and David Gedye at his 40th birthday party, 12/2000. 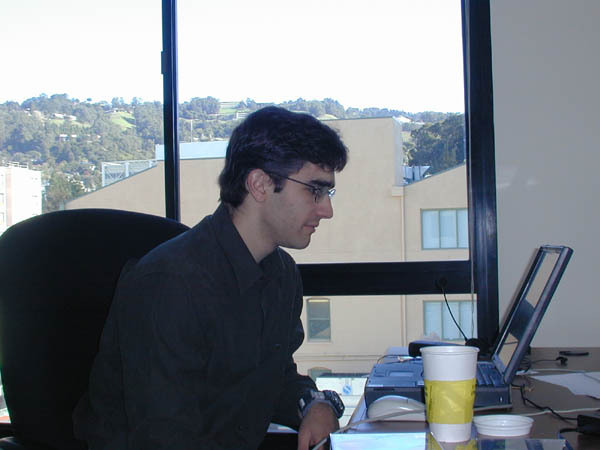 My co-worker Justin Lee, Jan 2001. 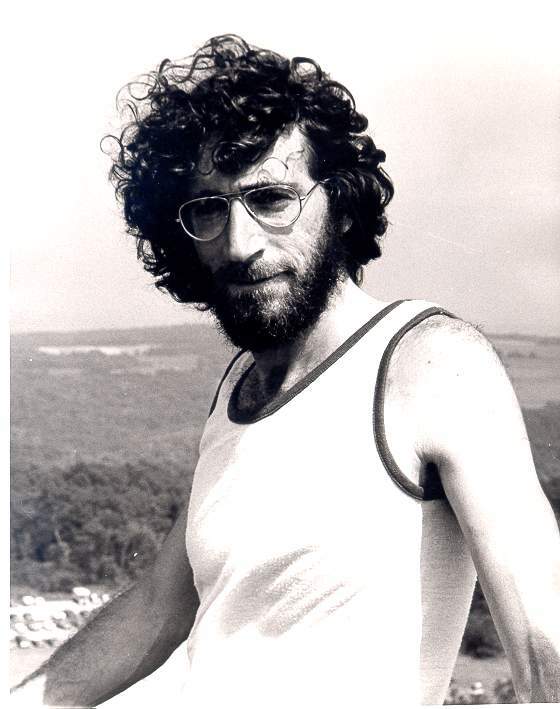 David Weinberg, in Wisconsin ca. 1983. I printed this one myself! 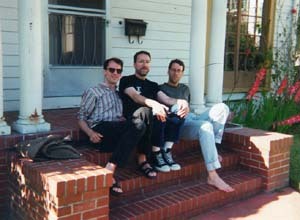 The two Daves (Gedye and Weinberg) at my old house on Lincoln St. The car in the background (Weinberg's) came to a bad end. 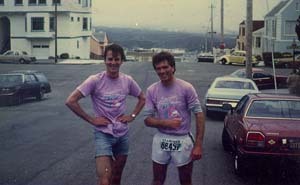 Dave Gedye and me at the completion of the Bay to Breakers, 1986. 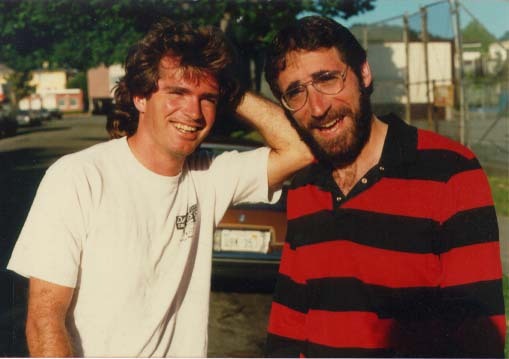 Dave and I were running partners for several years. I pushed him to a 5:10 mile at one point. 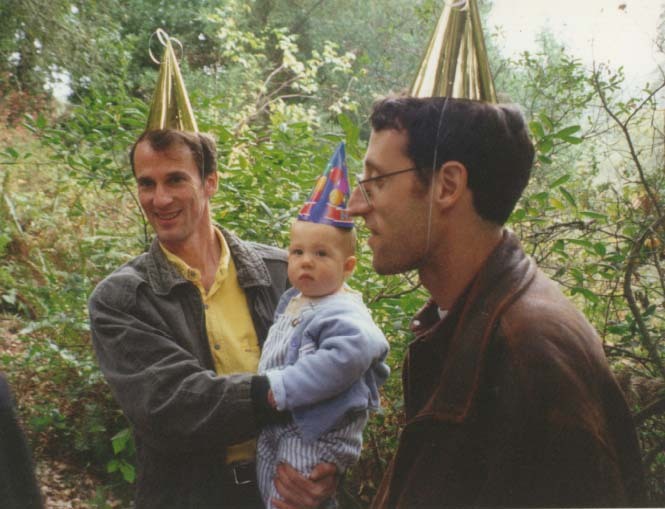 My pal (and Evil Twin) Dean Jacobs (foreground) and his son Nick, at Nick's first birthday party in Tilden Park. Nick has slimmed down a bit since then. Dean and me in his back yard, discussing possible translations of Romantic German poetry (I kid you not). 3/98. 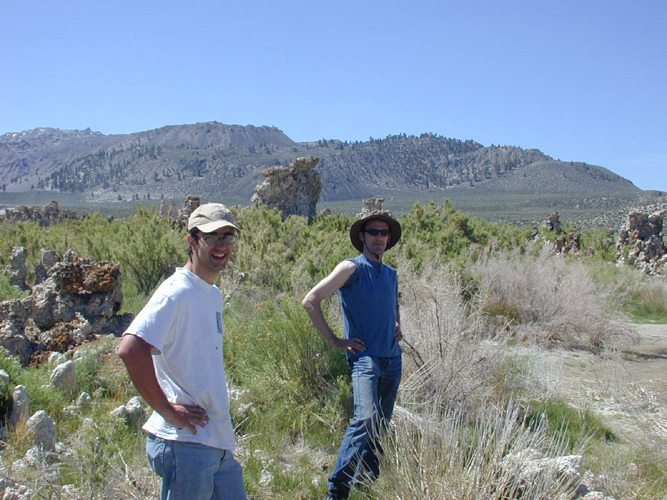 Weinberg and Dean, Summer 1997. 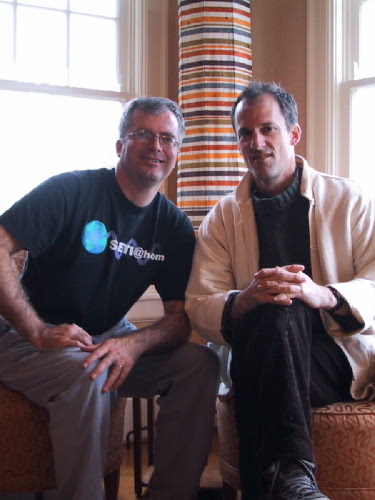 Ron Kuivila and I met at Wesleyan, 20-odd years ago. 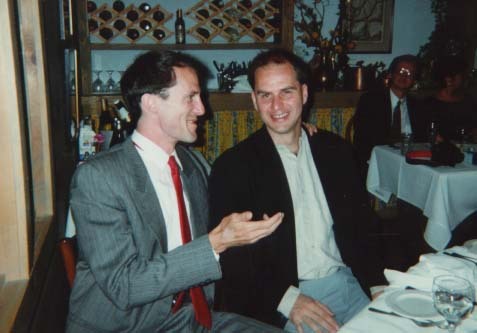 Here we're at his wedding in Sun Valley, Idaho, 1996. I'm apparently dispensing some kind of marital advice. David Weinberg and Ron Kuivila, same trip, halfway up the ski run. 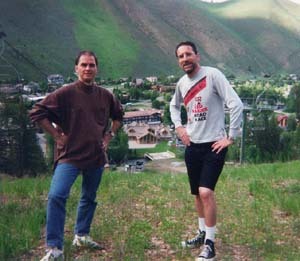 Sun Valley 1996. 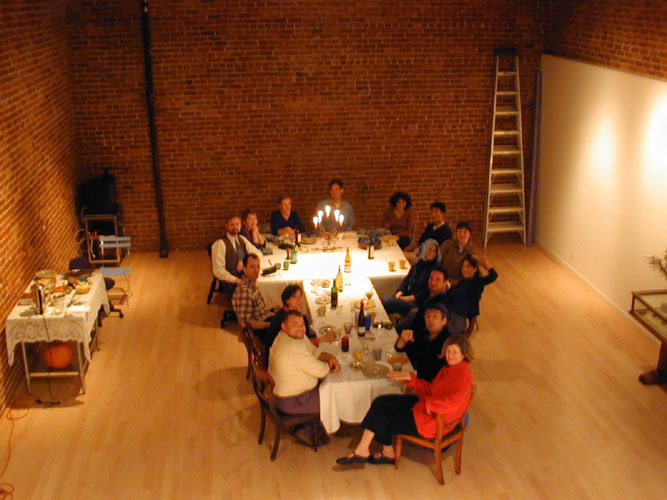 Dave Gedye and Connie Uratsu at outset of Mt. 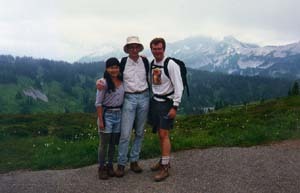 Rainier hike, 1996. Me, George Homsy and Sabina Mackey. A UFO appears to have landed on my head. Ellen Recko, visiting from Wisconsin, Fall 1985. She now lives in Portland, Oregon. Julie Chan, poet/teacher friend from Berkeley. 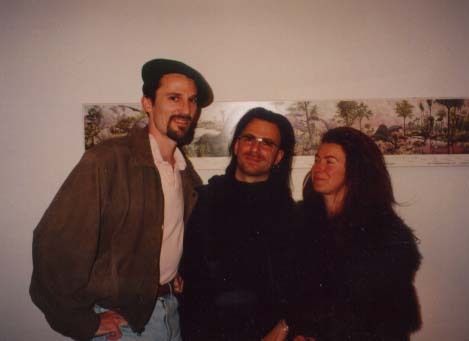 Kerstin Fischer, her friend Andreas and me, at their house in Bielefeld, Germany. Laura Hollingsworth and me at the wedding of Ann Richardson in Seattle, 1991. Yes, we look good together, but she was NOT my date. Mary Zawadzki, the day before she raced in the Head of the Charles Regatta, having lost about 20 pounds in a month to get into the Lightweight division. She didn't win. Mary is the all-time women's Ergometer champion. Circa 1981. 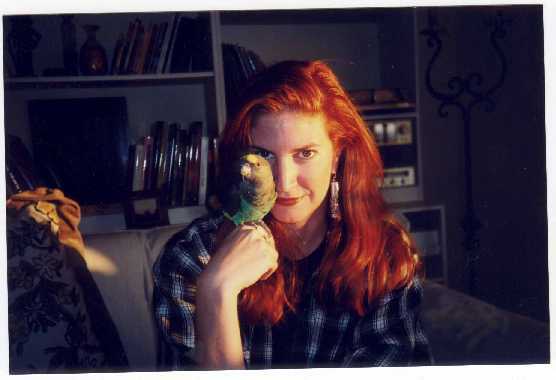 Another picture of Lynne (and her parrot Rummy, who's a bad bird - he bit me).